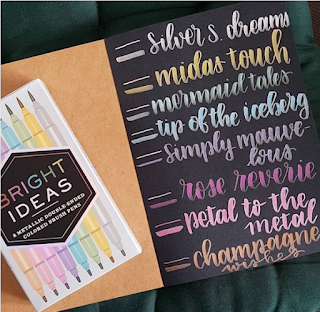 Talk Bujo to Me | Bright Ideas Metallic Brush Pen Review. Disclaimer: I received these pens from Abrams - Chronicle Books for review purposes, but every opinion is my own. I'm not paid. This set is the Bright Ideas Metallic set, which consist of 8 double-sided pens. One side has a regular marker, the other side is a brush pen. I love double-sided pens, because it makes them more diverse. You can use the regular side for normal writing or decorations, while the brush pen helps you to make more fancy handlettering. The brush pen itself is more flexible in comparison with the Tombow Dual Brush Pen markers. I don't mind the difference, but I would say it is harder to work with as a beginner. It took me some extra practice to get straight lines. I love the different effect it gives, because you can make even thicker down strokes by pressing harder. I prefer these pens over the Kuretake Fude Brush Pen, because the tips from the Bright Ideas set are smaller. The colours are beautiful and have a nice metallic sheen. I love how bright and colourful they are, not opaque at all. As you can see this is more noticeable on black paper, but I also love the effect on regular white paper. 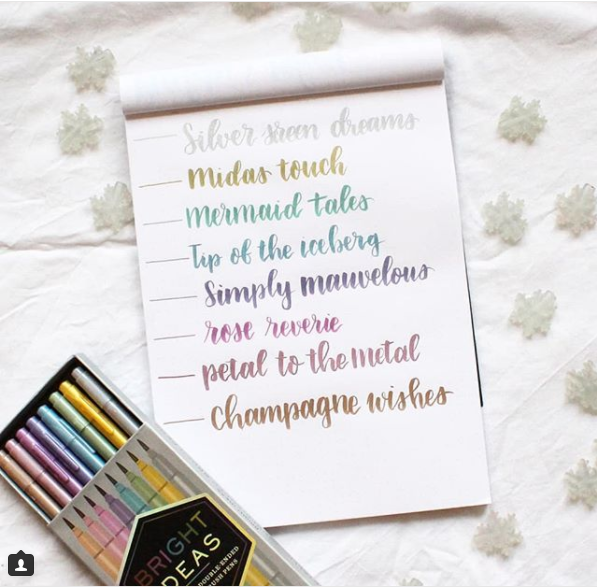 The 8 colours are Silver (Silver Screen Dreams), Gold (Midas Touch), Green (Mermaid Tales), Blue (Tip of the Iceberg), Purple (Simply Mauvelous), Pink (Rose Reverie), Light Pink (Petal to the metal) and Copper (Champagne Wishes). This is a perfect range of colours to work with, although I would love to get a red shade! -The Bright Ideas Notebook, with different coloured paper. -Graphite Pencils, also in Metallic Edition. I'm really happy with this set and I'm definitely interested in trying out more products, like the regular set with the primary colours. Monthly Recap January '18 | Wedding Updates. This was a really exciting month for me, where I made some progress towards the wedding. I went to the Hello Beautiful Wedding Event hosted by Randy from Say Yes to the Dress. It was such a fun experience with my mother, grandmother and sister. We saw two big wedding shows (where he showed some dresses from his new collection) and he gave some tips and tricks about looking for your wedding dress. I got some inspiration from the stands, mostly for rings and entertainment and we had a nice lunch. Next up was my appointment to try on wedding dresses. It was my first time and I found THE dress. It was the 7th dress I tried on and I am not kidding when I say I had my true 'Say Yes to the Dress' moment. I walked towards the mirror that covered the entire wall and then I had tears. I just felt so beautiful and it made me realize that I'm really going to be a bride, haha. The experience overall was fabulous. The lady who helped me listened to my likes/dislikes and she eventually picked out the dress for me based on my opinions. She never made me feel rushed and at the end of the appointment she even let me walk around my dress for rougly 15 minutes while she was taking care of all the details around buying the dress. 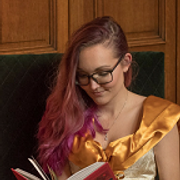 It was also incredibly special that I had my two grandmother's with me (together with my mom, sister and practically second-mom, because this family friend has been around for forever) It was fun to try out two dresses completely the opposite of my taste - and it proved to me that I was looking in the right direction. It was mostly all the elements I was looking for and I can't wait to wear it on our big day! Another fantastic event was seeing Lady Gaga's concert! She is truly an artist. She knows how to entertain her crowd and her voice is unbelievable, especially if you consider she is dancing all the time. And last but not least, I went to Pitch Perfect 3 with my mom and sister and I loved it + I surprised Jasper by taking him to Jumanji, which was hilarious. I broke my book buying limit (5 books every month) for one reason: I got a gift card as Christmas bonus from work, so of course I had to get some books for it, so I got four extra. 1. C.J Redwine – The Wish Granter. 2. Zoë Marriott - Shadows on the Moon. 3. Robin Hobb - Assassin's Apprentice, because it's time to read a book by this author. 4. J.K Rowling - A Journey through the History of Magic. 5. J.K Rowling - HP and the Chamber of Secrets illustrated. 6. Katherine Longshore - The Bear and the Nightingale. 7. Ashton, Hand & Meadows - My Lady Jane. Bargain. 8. Stina Leicht - Cold Iron. Bargain. 9. Marjorie Lu (author) + Sana Takeda (illustrator) – Monstress. I also received two awesome review copies from Abrams. I've emailed them telling them that I would love to review some of their art products too, so I received this gorgeous 'Find your Adventure' notebook and a practice book for Watercoloring. I can't wait to try them out and review them after a few months! And the last thing that came in the mail was my Fairyloot January box 'Talk Faerie to me'. I already had a feeling we were receiving Holly Black – The Cruel Prince and I'm stoked. I've heard so many good things about it! I'm also in love with the pillow case and the Faerieland exclusive coloring book. Since last year I've been in a little funk when it comes to reading, but I participated in Bout of Books and I'm back into it! 1. Melissa Bashardoust – Girls made of Snow and Glass. 4.5/5. Favorite! 2. Sarah Andersen – Herding Cats. 4/5. 3. S. Jae Jones – Wintersong. 3/5. 5. Sarah Prineas – Summerkin. 3.5/5. 6. Sara Holland – Everless. 3/5. 7. Sarah Prineas – Moonkind. 3/5. 8. Marjorie Lu + Sana Takeda – Monstress. 4.5/5. Favorite! 1. Vikings season 5, episode 1-7. Oh boy! 2. The Punisher season 1, episode 4-8. I'm enjoying this more than Daredevil. 3. Game of Thrones season 2, episode 2-4 rewatch. 4. Sense 8 season 2, episode 7-8, I'm watching this really slowly because I don't want it to be over..
5. Outlander season 2, episode 2-3.